Everyone wants safe transportation systems to travel from a place to another easily and securely. However, many issues and challenges make transportation systems less safe than they should be. Among these issues are rapid urbanisation over various landscape forms, population growth and migration of people from rural to urban areas. Other challenges include lack of technical tools that can support road safety managers to efficiently simulate future scenarios and create remarkable plans for solving problems concerning road safety. If these problems continue, then failure of transportation systems will greatly affect the stability and development of modern cities because transportation systems are the heart of the cities. Thus, providing solutions for such problems is among the previous research topics in the fields of transportation and geomatics. Fanos, A. M., & Pradhan, B. (2018). 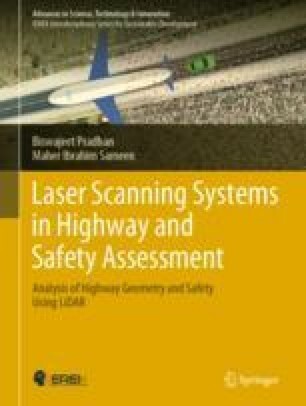 Laser scanning systems and techniques in rockfall source identification and risk assessment: A critical review. Earth Systems and Environment (Article online first available). https://doi.org/10.1007/s41748-018-0046-x. Fanos, A. M., Pradhan, B., Aziz, A. A., Jebur, M. N., & Park, H. -J. (2016). Assessment of multi-scenario rockfall hazard based on mechanical parameters using high-resolution airborne laser scanning data and GIS in a tropical area. Environmental Earth Sciences, 75:1129. http://dx.doi.org/1007/s12665-016-5936-3. Fanos, A. M., Pradhan, B., Mansor, S., Yusoff, Z. M., & Abdullah, A. F. B. (2018). A hybrid model using machine learning methods and GIS for potential rockfall source identification from airborne laser scanning data. Landslides (pp. 1–18) (online first available). https://doi.org/10.1007/s10346-018-0990-4.